This is the first painting that I feel can't stand alone, that It needs an explanation. I saw it as it were a vision in my head. It is simply on one hand a depiction of our Lord's scourging along with the whip they might have used. Also a cup spilling it's contents as did he. 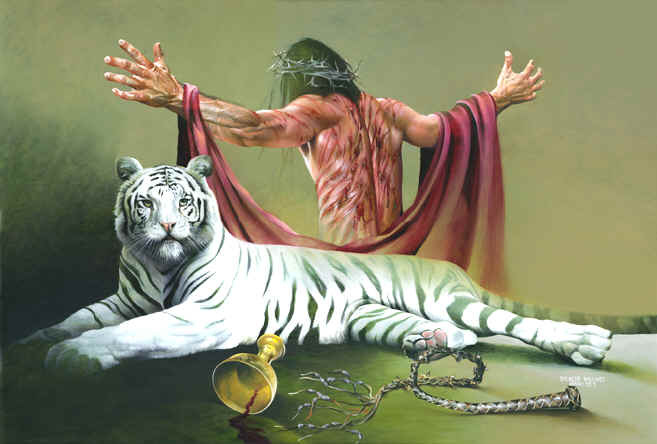 I see the white tiger as a picture of the bride purchased for God by Christ. The marks that he bore define our character, they make us who we are. As do the stripes make the tiger who she is. A powerful creature arrayed in white bearing the image of the scourging as beauty marks, now for us a reminder of the cost of our salvation. 88 "The Back of Christ"